Amidst the impressive ruins of the Acropolis, the Parthenon and the Temple of Zeus, a group of improvisors finished off each others sentences, created their own epic stories and made up songs never heard before and never to be heard again at the Mount Olymprov International Improv Comedy Festival. Improv festivals are fast becoming popular. Apart from the obvious, that is, learning new skills and getting to work with workshop leaders from the world over, the festivals have become a sort of special microcosm where old acquaintances are renewed, friendships rekindled and new pals made, all in the space of a few days. Mount Olymprov, held in Athens, Greece, between 5 and 9 June was no different. Staying in the same hostel, having breakfast together, doing workshops together and then watching or performing in shows for four consecutive days brings people close together, especially so when it's improv you're doing. 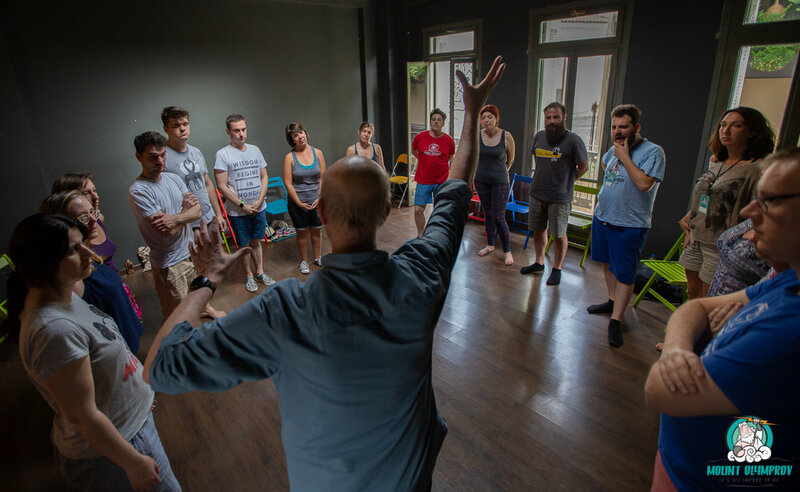 There is something particularly special about this discipline, which relies so much on participants being open, listening to and supporting one another. Without any of these three, it's not good improv. Of course, a fantastic location doesn't hurt and being able to have breakfast with views of the Acropolis, pop into the Parthenon, walk around Europe's oldest capital and hop onto a train to one of the many splendiferous Greek Islands is surpassed by little else when it comes to travel attractions. The festival saw a wide variety of workshops led by the likes of Charna Halpern, Lee White, Nicky Byrne, Feña Ortalli and Gary Schwartz, who has kept alive the wonderful Spoilin Games. These games were developed by Viola Spoilin in the 1920s as an easily grasped system of theatre training that could cross the cultural and ethnic barriers of the immigrant children with whom she worked. Unfortunately a lot of the workshops were often rather crowded, with up to 25 participants in at least two workshops I took part in and which greatly detracted from what could have been even far better events. A plus of this festival was definitely how everything was within walking distance, from the workshop venues, to the hostel, and the performance venue. The organisers had also gone to through the trouble of sourcing eateries that would offer special rates for participants. Another treat was that there were special activities, such as a free walking tour, on offer each day for those who had free gaps in the day. Sadly I had already jam-packed my timetable too much to be able to go to these. Hats off to the dedicated festival organisers for putting in so much hard work. It is no joke to organise a festival, as I am quickly learning, as I organise my first festival, to be held next year in my home island of Malta. Watch this space! There is hardly any other place in the world where you can encounter the art and culture of classical antiquity as closely as in the Munich collections on Konigsplatz. The Glyptothek houses one of the most important collections in the world of Greek, Roman and Etruscan art. Veronica Stivala took a walk around this fascinating museum. You’ll be forgiven for scratching your head over the meaning of the word ‘Glyptothek’. You see, the name ‘Glyptothek’ is a modern, made-up word. The word is an amalgamation of the old Greek words ‘glyphein’ (to sculpt) and ‘theke’ (repository), thus making it a storage place for sculptures. And what a storage place it is. The Glyptothek on Munich’s Königplatz possesses some of the finest Greek statues in the world. The Glyptothek is the only museum building in the world that is solely dedicated to antique sculpture. The long, high-ceilinged, vaulted halls in this museum in the centre of Munich’s museum district are in themselves impressive, but couple them with rows upon rows of Grecian busts poised on marble pedestals, many looking in the same direction and you have a museum quite like no other. The monochrome neutral palette that permeates the halls gives them an added eloquence, a certain grandeur if you will. Greyish stone slabs line the floors from which rise creamy brown walls, peaking in wide columns and grand arches. 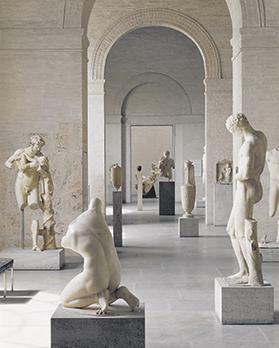 To this add light – the rooms at the Glyptothek are built around an open-air courtyard giving them access to natural light, that falls artistically on the statues’ curves, crevices and edges. To walk along such hallways, populated with majestic marble statues that date as far back as 220 BC is humbling. So many figures look down, at or past me, silently, so still, a link to a very distant past of yore. The Ionic temple façade itself symbolises the plan quite clearly – with the Glyptothek, Crown Prince Ludwig, later to become King Ludwig I, wanted to erect a memorial to Ancient Greece. The museum was originally built by architect Leo von Klenze. Between 1806 and 1830, when the museum was opened to the public, Ludwig managed to amass one of the most important collections of antique sculptures to this day. He acquired masterpieces such as the Augustus Bevilacqua, the Medusa Rondanini, which was highly admired by Goether and the Barberini Faun. It was thanks to Ludwig’s art dealer, Johann Martin von Wagner, that Ludwig managed to get hold of these extraordinary pieces. Wagner “combined an unerring eye for antique art with brilliant scholarly talent and great commercial aptitude”. So, in a very short time, between 1810 and 1820 an inventory of first-rate sculptures was created. This was subsequently enhanced with further specific acquisitions. Other noteworthy attractions also include the Kuoros of Tenea, the boy with a goose and the relief of the peasant with his cow. The time period of the antique originals spans from the Archaic period (sixth century BC) through the Greek Classical period (5th/4th century BC) and the Hellenistic period (3rd to 1st century BC) right up until the Roman Empire and the Late Antiquity (1st-5th century AD). Alongside the sculptures that, at one time, adorned sanctuaries and public places and buildings or served as funerary monuments, the marble sculptures in the Glyptothek also include numerous portraits of prominent ancient poets, philosophers and rulers, from Homer to Plato, from Alexander the Great to Augustus and Marcus Aurelius. Visitors to the museum today will see a renovated version as the building was badly damaged during World War II. Prior to the damage, the halls in the building were adorned with colourful frescoes and magnificent plastering. Curators who know both versions – the museum was reopened in 1972 – say that even though, today, the rooms are very different, they are just as impressive. A word must also be said about the museum’s gorgeous café. Aside from its delicious cakes (baked with whatever sumptuous seasonal fruit there are around at the time), when the weather is fair, patrons can enjoy the beautiful courtyard, sipping their coffee and savouring a delectable sweet, while the white marble statues peek at them through the glass windows. This article was originally published on The Times of Malta, May 2016.